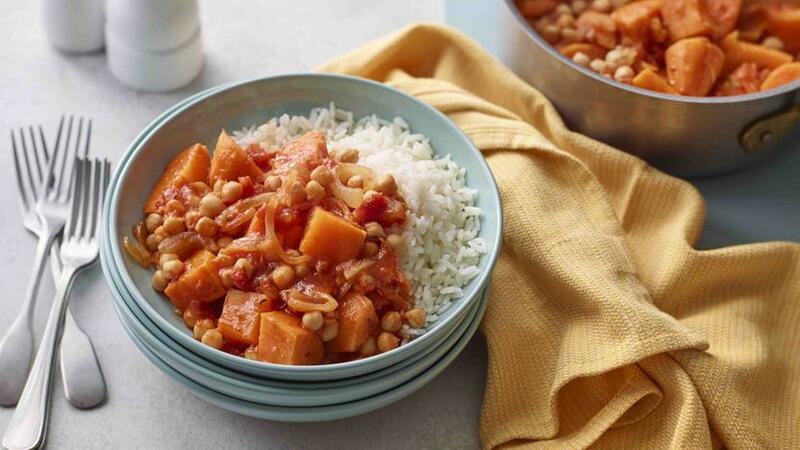 This easy sweet potato and chickpea curry takes only a few store cupboard staples - perfect for a laid-back supper. This is designed to be a low cost recipe. Each serving provides 551kcal, 15.5g protein, 97g carbohydrate (of which 14.5g sugars),	8g fat (of which 1g saturates), 13g fibre and 0.2g salt. Cover with a lid and simmer over a medium low heat, stirring now and again, for 25-30 minutes, or until the potatoes are soft and beginning to break apart and the sauce has thickened. Top up with a little more water during the cooking if needed. In May 2013 this recipe was costed at £3.63 at Asda, £3.74 at Tesco and £3.83 at Sainsbury’s.